In the words of someone really smart: it is finished. I’m home now and as I think back on the events of the past weekend, I’m a bit dazed. I ran my first half marathon race. It was a highlight of my entire life: one of those moments that mere seconds after they slip away, become gilded in one’s own mind. It seems like a dream, so outside the ken of regular existence for me that it all was. But the most beautiful and uplifting of dreams. A blissful dream that finds you smiling as you wake – stretching languidly – and every time you think of it thereafter. A real ultimate bucket list check mark. 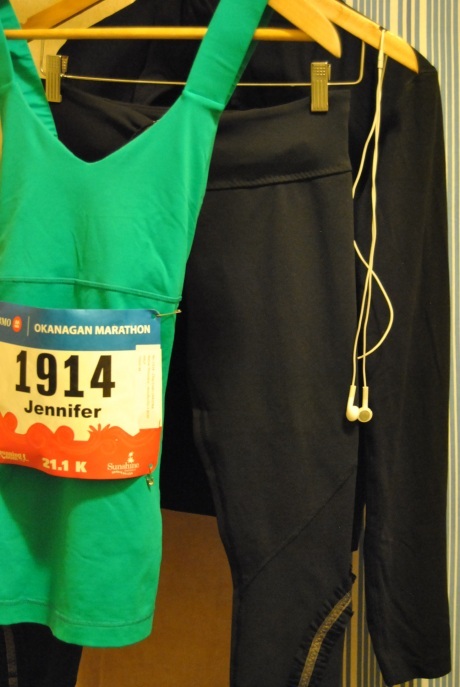 Though only a day stands between the two of us, the half marathon and I, the woman I was before I ran those 21.1 kilometers is less substantive than the One I morphed into afterwards. I am stronger today and though that other woman rarely did things that made her own heart race with pride, this woman today I feel resonantly proud of. I like this new woman better and I want to be her from now on. I feel strong and able. Capable. I feel like someone you’d be wise to rely upon. All of this, I feel coursing through my veins because I ran a half marathon. But enough of all this self-admiration. Thank you for listening to it, all the same. We arrived at the half marathon early in the morning. I showed up with a plaguing cold, mild though it was. I came, too, inadequately braced by a terrible sleep in a hotel bed the night before. These things loomed up hugely to bother me disproportionately because I didn’t know how they would affect my run on this day. Our race was slated to start at 7:45. Crowds of people, thousands of them, milled around with an electric energy. It was humbling to see that in my complex preparations, I was not all that special. Thousands of people had just spent the previous three months of training in much the same way I had, pushing their bodies in ways they weren’t sure they would go. Many of them were much leaner than I; fit in that obvious I-am-am-athlete sort of way. Many, though, I was surprised to note, were much heavier than I was. Toward these, I threw out internal kuddos for their go-hard-or-go-home approaches to living life. They were grabbing their health by the horns and bypassed the babysteps stage entirely. There were elderly people there, too. These ones were my favorites and I want fervently to be just like them when it’s my turn. Everywhere I turned, there was someone who inspired me. Everywhere I turned, there were displays of kindness. I learned that day that I love the running subculture. These people all feel proud of you and you find yourself feeling so proud of each of them. I proved to myself many times that day that much though I wished to feign that it be otherwise, I was an emphatic Newbie. We took our time lining up in the chute and as a result, were never able to weave our way through the masses of humanity to the Pace Bunny we needed to be near. I felt like I brushed up against thousands of people on my way to finding the 2:00 Guy. 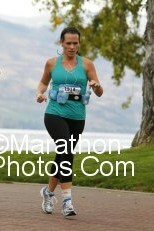 I only ever made it to the 2:15 Guy and to all of those more organized runners that day, I extend my apologies. I know I and my ilk are probably annoying as we strive to get past you as you line up neatly where you know you belong. My consequence was that I lost chunks of valuable time as I painstakingly weaved through dense thickets of runners to get where my pace dictated that I finally belonged. Fortunately, I did all this during the first 5 K or so, which was an industrial and less-than-enchanting part of the course. I hardly noticed. Littering the sides of the road were throw-away hoodies and sweatshirts that the entrants had worn to stay warm as they huddled, waiting to burst forth past that starting line. There were gloves too, lining the side. I was struck then and still at how considerately all of these things were disposed of. It was all very neat. Soon we began to see spectators at the side of the road. Some had cowbells which jarred joy into my heart. I was surprised at the emotional catch at the back of my throat I sometimes felt seeing these cheering, well-wishing people. It also came in remarkably handy – that day – having my generation’s most common name. There were – I think – three huge signs saying Go Jen(n), Go! or We Love You, Jen(n)! I pretended that they were for me and smiled so that my cheeks hurt as I ran past these beneficient people. It was the first and only time I loved my name. Usually I just rue the fact that a baby name book has recognized the ridiculous commonality of it in its title: Beyond Jennifer and Jason. O the banners. There were so many signs held aloft by so many people who woke so early to do so. Signs and banners that said things like If it was easy, I’d be doing it! and Run Like You Stole Something! and You’re So Pretty and Smart! One girl ran past me and I loved her as I read the back of her shirt. It said, I don’t know you, but I’m so proud of you. I still love that girl who took time out of her day to have that t-shirt specially made. Each time I read something like it, I felt a surge of new strength and my legs pumped that much harder. My heart lurched when I read one man’s t-shirt: I’m running this race for my Grandson Kyle, who didn’t live to take his own first steps. I guess I was just really surprised at the emotional intensity of the race and its peripheral events. I thought I was there to run 21 kilometers, but I came quickly to learn that there is so much more to it than that. There was the loud music saturating the air at the start line that pumped your blood faster through your veins even before you started to run. There were the jostling masses of humanity that pressed up companionably against me as I milled around before and after the run itself. People I’d never met yelled out their congratulations and I even heard myself telling the girl who stretched next to me that we rocked. And in that moment, we really did. There, too, was the spectacular beauty of certain sections of the course. At one point, I felt a burst of gratefulness toward my God because as I ran, there was a light rain speckling playfully down upon me while all at the same time, the sun shone brilliantly and a double rainbow splattered itself gleefully across the sky. I met a semi-famous guy. Perhaps even that descriptor is a stretch, but I looked casually to my side at one point and said in surprise, Well hi John Stanton! He laughed and asked me how my race had gone. He’s the founder of the Running Room stores you see peppered across the country. So that was mildly cool. I didn’t quite make my half marathon time goal of hitting under 2 hours. Nor did I want to talk about it much beforehand, for fear of jinxing myself – or perhaps more accurately of putting a goal out there publicly only to then potentially fail to meet said goal in same flamboyantly public manner – but I just thought it would be well nigh magical to have a 1 instead of a 2 for the first number in my finish time. I came in at 2:04, but instead of the disappointment I expected to feel, there was only euphoria washing over everything. As I crossed the finish line, some other dedicated and good-hearted volunteer put a finisher’s medal over my head and for the first time in my life, I felt like an athlete. The arches of my feet began to cramp up painfully, but it didn’t matter in the slightest. A man who had run near me for the last three kilometers or so stopped to share colorful battle stories. I’ve learned some things along the way during my half marathon. I did many things badly. But that’s ok, because my myriad mistakes add up to ensuring ample room for improvement for next time. I’m officially enamoured. I’ve found my new favorite activity. Congratulations on a wonderful accomplishment!